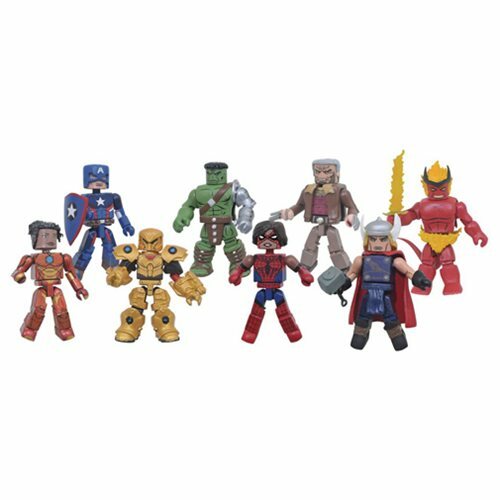 The 74th series of Marvel Minimates is one for the ages! Spanning over four different storylines from Marvel's history, this assortment of two-packs captures four of the greatest Avengers in four of their most epic battles, with four new outfits and four never-before-made opponents! Prepare to see Thor and battle against Surtur and see King Hulk take on the Red King! Fans will definitely not want to miss out on this one-of-a-kind battle pack! Each 2-inch Minimates Mini-Figure features up to 14 points of articulation, as well as fully interchangeable parts! Each 2-pack comes packaged in a full-color window box. Ages 8 and up.